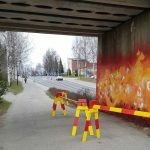 In 2017 I was working on a six month art grant period provided by Arts Promotion Centre Finland. 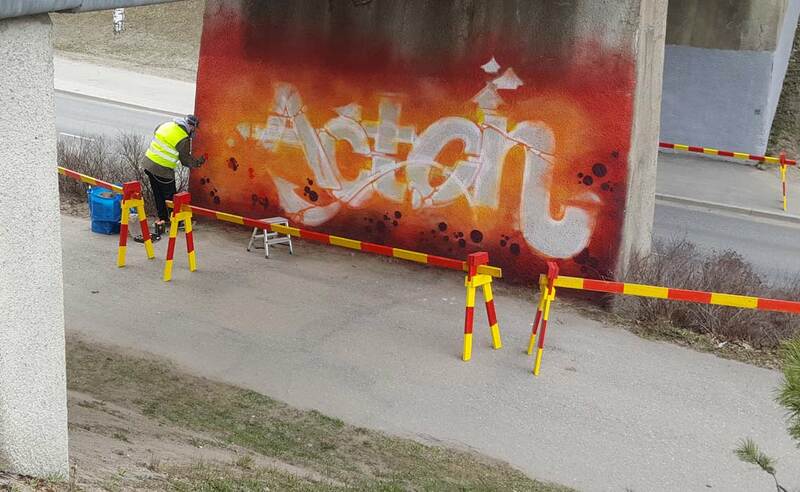 Major part of this period was to create at least one, larger permanent graffiti painting outdoors. Well, I painted three. 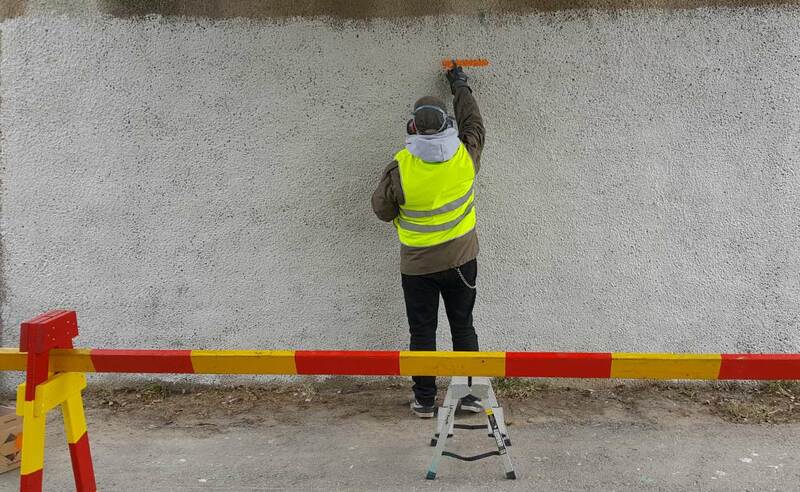 The reason, as explained in previous portfolio article, why I ended up painting three walls instead of one was simple: I applied permits for two cities – Outokumpu and Vantaa – and was lucky enough to get ’em both approved. 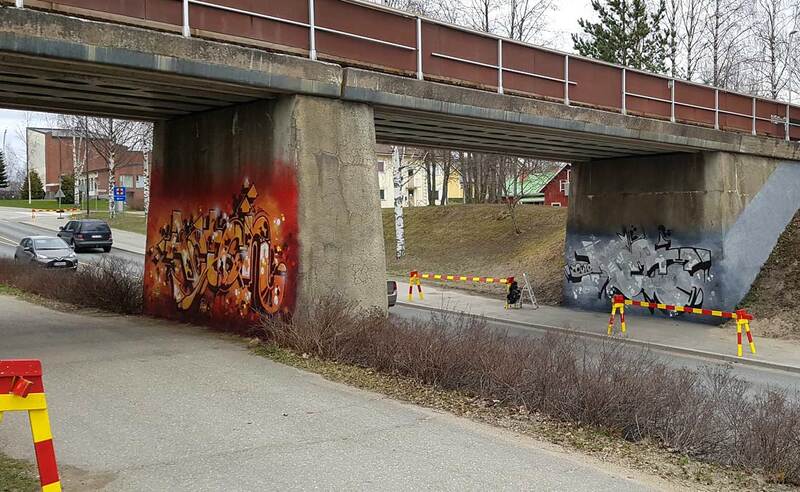 Both cities went even as far as offered two walls to paint instead of one. 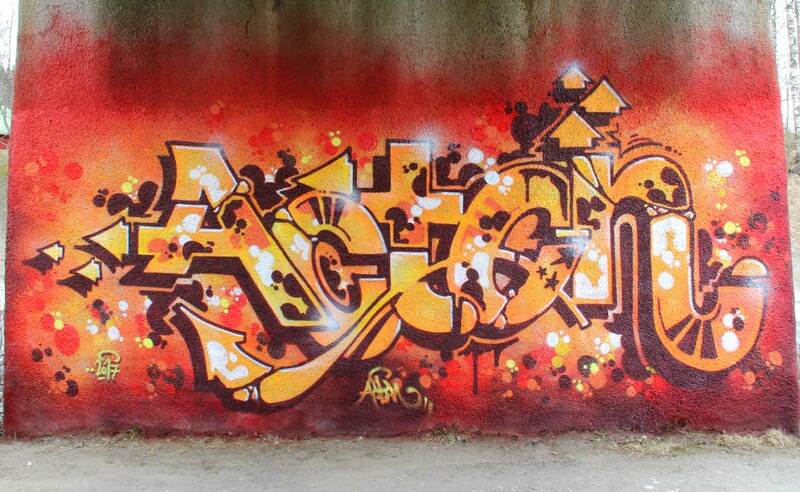 And both of ’em knew from the get-go that I was about to paint strictly letters in my own, personal style. 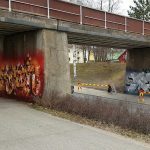 This article focuses in the graffities I painted at the lovely city of Outokumpu, an old mining town located in the middle, eastern parts of Finland. 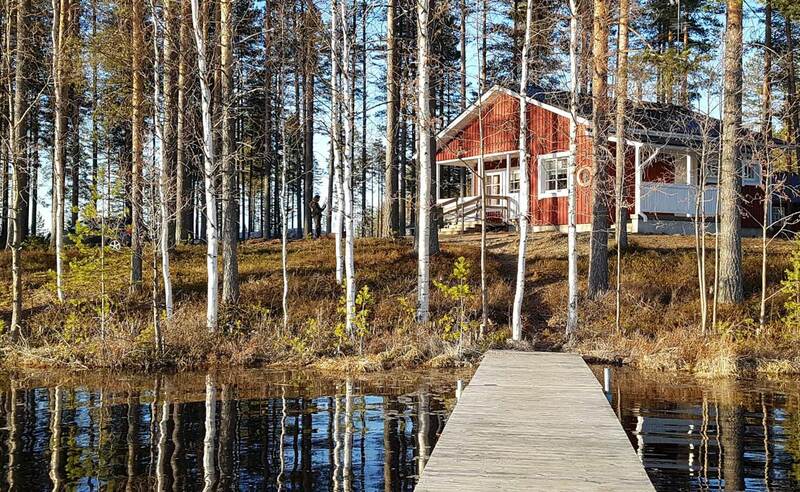 Well, first and foremost I wanted to avoid the obvious option, my current hometown Helsinki. I actually made this decision when writing the art grant application back in 2016. 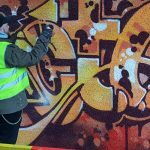 If you ask me, Helsinki is already suffering from a street art fever to a level of major irritation: there are tens of different happenings and projects revolving around street art and most of the people who like to think that they’re “hip” and “cool” have a hard on for street art. I saw no point in trying to add more water to the pool with my common or less cool art. I also expected that the city officials might have their hands full with all the the applications for all the different projects and I was naturally worried about the processing times of my possible application. Instead of constant waiting I just want to concentrate on the actual doing, so to speak. 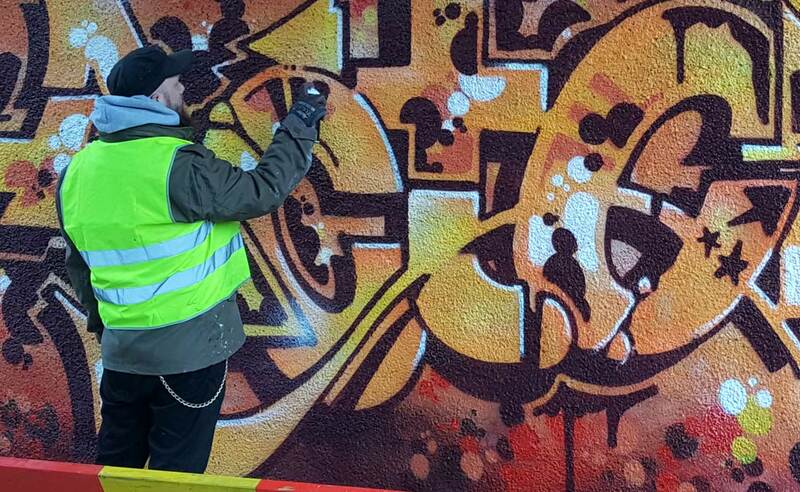 During May 2015, while I still was a graffiti entrepreneur, we held a graffiti workshop for the school of Outokumpu together with my colleague and crewmate Soved. We spent three days at the city and I have to admit that something in the atmosphere of the town made me feel like home. 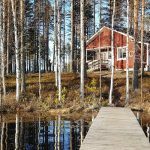 The fact that my fathers side of the family originate from the same, eastern parts of Finland might have something to do with this. 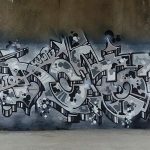 Or the fact that the people treated us well and didn’t have any prejudice towards graffiti and us, people who have been doing it for so long. Either way, when year and a half later my application for art grant was approved, I immediatelly thought of city of Outokumpu and a possibility to work there again. 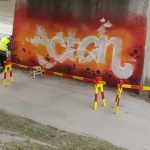 So I contacted youth worker (and from 2017 a freshly selected city counciller) Werne Tanskanen and told him about my art grant and that I’d be interested in painting at Outokumpu. He liked the idea and started working on it. And pretty soon he got back to me and said that we got green light for the project and now we just need to sort out a suitable place for the painting. In addition to that he said that the local school would be very interested in having another workshop, only if it’d fit my plans. 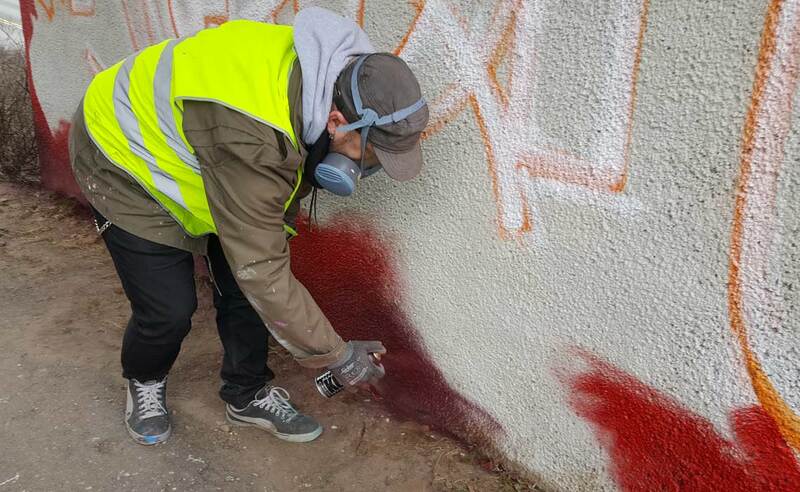 It didn’t, but I contacted my crewmate Soved again, who already knew the city from our previous visit, and asked if he’d be interested tagging along and leading a workshop while I’d be painting. He was and… well, that’s really it. Werne even had few alternative surfaces for me to choose from. Once that was done it was time to begin working. Paperwork first and the actual painting before the summer holidays of 2017. 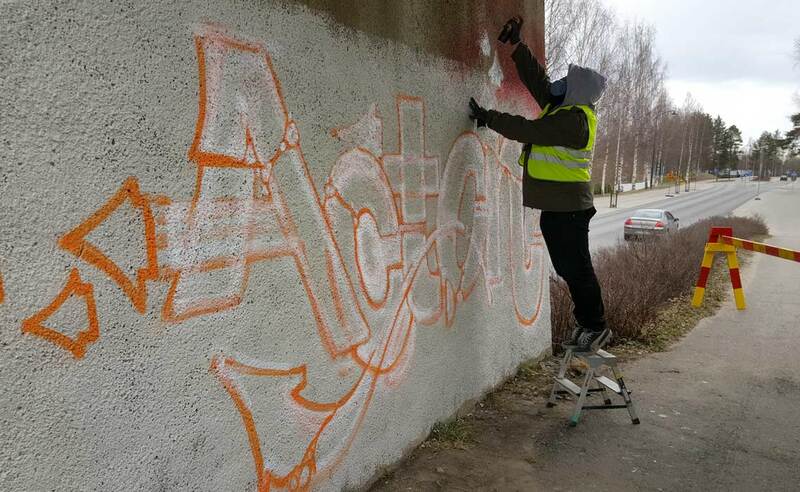 During the January 2017 I made sketches for the workshop and a rough design of the color scheme for my painting and attached them to the application I made together with city officials. All this was sent to Centre for Economic Development, Transport and the Environment. Yes, it is as horrible as it sounds. Reeks of bureacracy. But when you play by the book and do the application thoroughly and pay the dealing fee, usually all goes fine. Slowly but fine. I finalized my sketches and concept for the paintings at Outokumpu during February 2017 while spending time at artist residency in Spain with my family. By the early April 2017 all was set and approved. 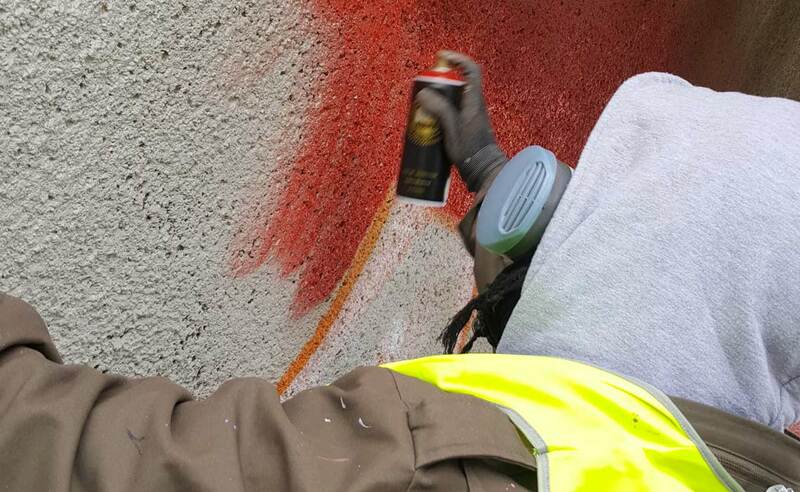 I would be painting for two days at Outokumpu during the second week of May. If Mother Nature would allow it. 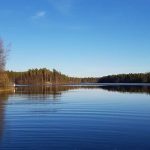 This really was not a joke: In 2017 we had the longest winter in decades, there was snow in southern parts of Finland even in late May. 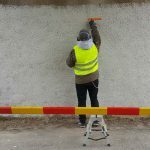 It was snowing three days prior when I was supposed to start painting and the locals had to postpone drawing of primer coating a few times. But the day before we hit the road with Soved the weather was finally as good as it could be under those circumstances. 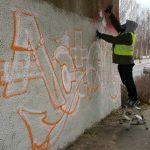 The kind people from Youth Workshop of Joensuu Association finally managed to primer the underpass where the workshop took place as well as the bridge which I was supposed to paint. And even most of the snow had melted away, few glimpses of this white stuff we saw at our accommodation. And a thin layer of ice on top the nearby lake, which melted away during our stay. It could be that one of the things why the city had such a big impact on me was the accommodation. 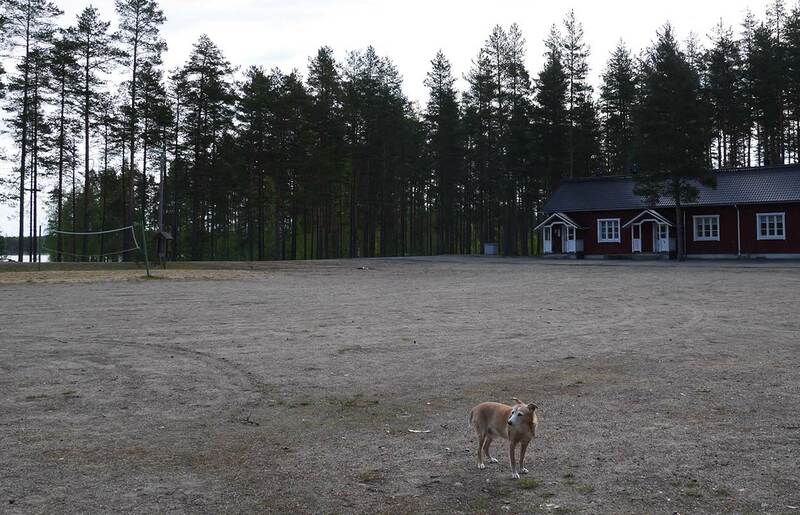 In 2015, during our earlier visit, we got to stay at camping area of Kolmikanta. It happened to be empty at that moment so we got to be there all by ourselves. It’s located by lakeside and is absolutely beautiful place. If I’d live at the nearby area, I’m sure I’d be sending my kids there at summer. So of course we were hoping to be able to stay there again during this visit and Lady Luck was on our side. We got freshly renewed cabin for us! 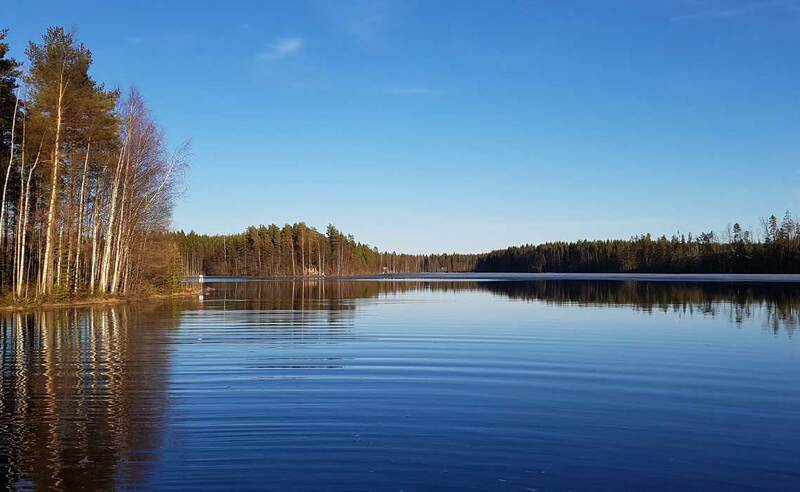 So for a city slickers like us, the peace or actually the complete silence – if you don’t count few birds shrieking and singing as noise – as well as serenity and beauty of nature was… refreshing. I’m a father of three, so I get my fair share of noise on daily basis, so for me this was more or less a meditative three days off home. I didn’t do much for the workshops, mainly because I concentrated on my paintings at the other location. But Soved had everything in control and Werne provided food and beverages for him and the students who participated at the workshop. All of them we’re eighth and ninth graders from the local school and few of them even had participated in the workshop we held there before. And if you ask me, those students burned the wall! Sure, we gave ’em rough guidelines to follow, but that didn’t slow ’em down. They we’re highly motivated and talented and they worked their asses off on both days. 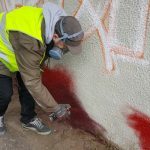 The first day they paid close attention to what Soved told ’em and instructed ’em about the use of spraypaint and various nozzles as well as few tricks and techniques. After that they pretty much managed to work on their own. 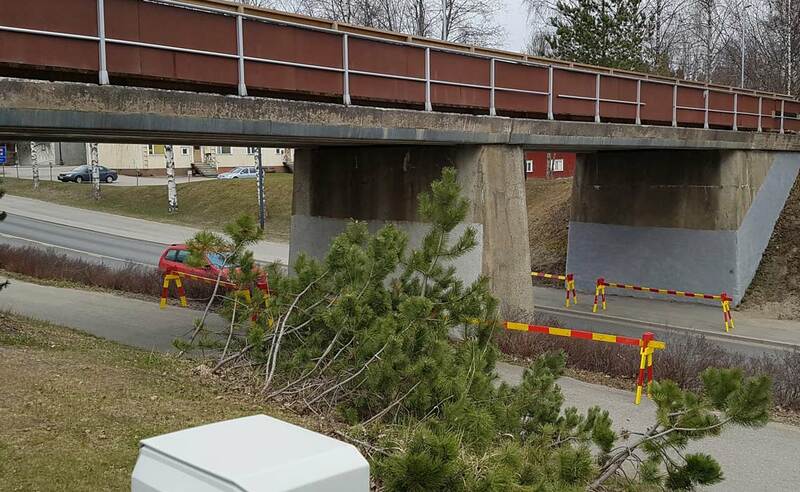 So, while Soved and students decorated the underpass on the other side of the town, I worked at my spot which was in the middle of the town: an old railroad bridge and it’s concrete bases. 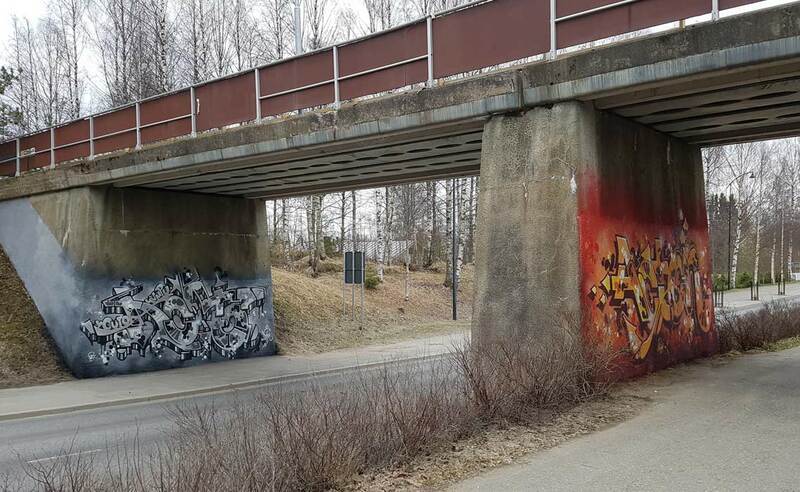 My idea was to paint slightly more neutral piece on the wall that’s directly towards the road and a bit more brighter version on the side that’s visible only to pedestrians. 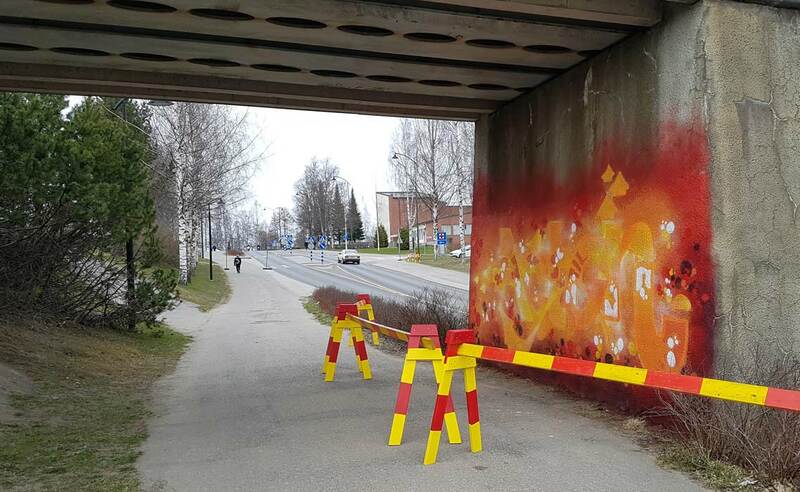 The plan was that both of the paintings would be visible for the pedestrians. The brighter painting was based on a canvas I did for my exhibition in 2016. 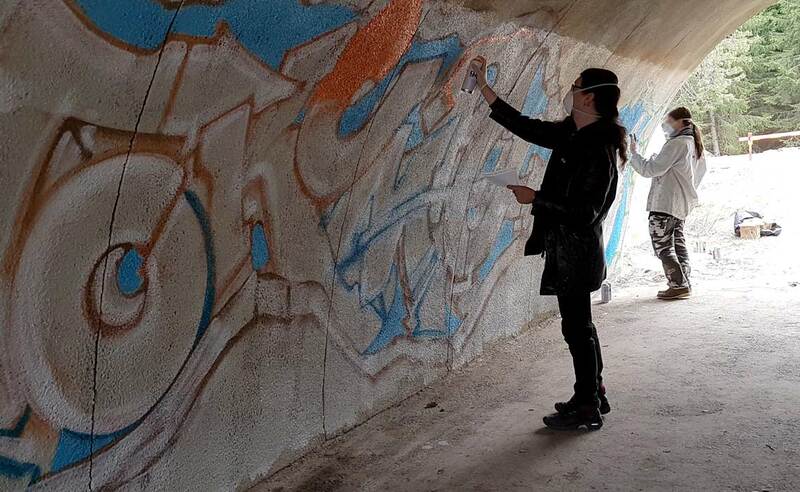 During that exhibition I examined the relation between Helvetica typeface and graffiti. 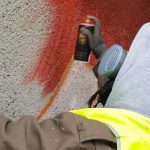 But I never got to actually test the theme in action with spraypaint during or before the exhibition so I knew that I wanted to close the circle somehow. I made one test version few months after the exhibition but it didn’t work out as I wanted so I knew I’d return to the subject later on. And now, in 2017 and at Outokumpu I finally did it. Soved was kind enough (or bored just staring me at work for the first day) and videoshot the whole painting process for the red piece. Video below. The grey painting on the other hand differs a bit from the red one. 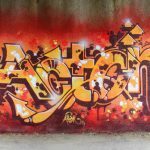 I wanted it to be “real” graffiti letters and not basic, block letters or variations of Helvetica – although if you look closely, you might notice there’s small, intended resemblance in letter C to the C in the reddish, Helvetica based Acton. I also wanted to do this piece in greyscale, partly to tone down the general feel of the piece so it wouldn’t be so blatantly in your face as many multicolored works could easily be. I’ve done only few greyscale paintings prior to this, which were in 2012-2013. I liked the idea a lot, but looking back now they were done a bit hastily and back then I still was in verge of “finding” my touch again. As most of you might know, I more or less got back in game in 2010, after an eight-or-so years period when I only painted less than five pieces in total. So by then I was still reinventing myself. The greyscale-idea stuck, but it took merely five years until I returned to the subject more thoroughly. 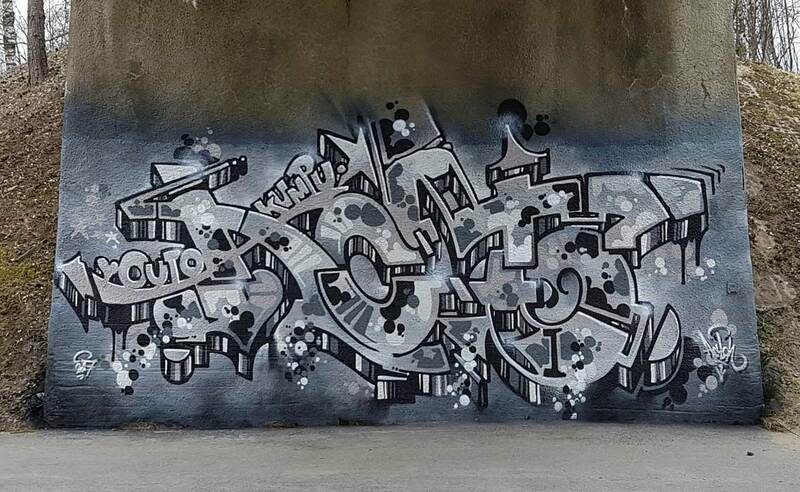 In addition to this painting at Outokumpu I made a larger greyscale painting together with Raw Deal crewmate Skin a week after the Outokumpu visit (picture here). Oh, I almost forgot: Youth Workshop personnel did so good work with the primer that they actually saved me quite a few cans of spraypaint with the grey painting. 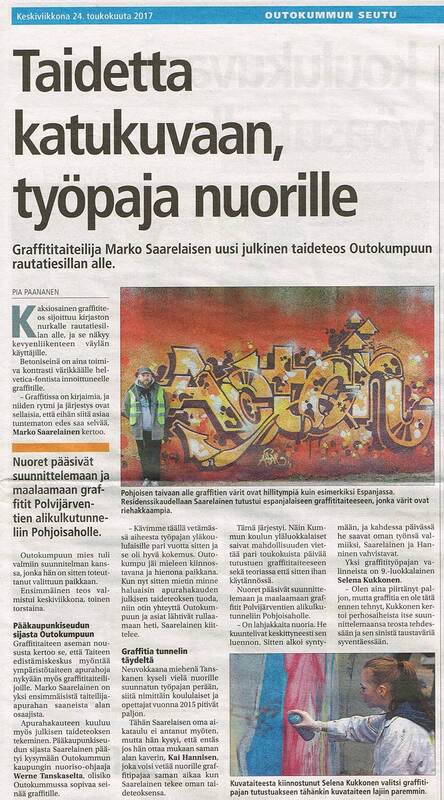 The region of Outokumpu -newspaper wrote an article of our visit. You can read it here.